Sleep is one of the most important things we have as moms. Mom brain is real, and sleep plays a big part in our health and wellness. We all know how hard it is to get a good night’s sleep when we’re always worried about our kids falling asleep and staying asleep, not to mention the endless list of chores that never seem to go away. However, did you know your own bad habits might be contributing to that groggy feeling in the morning? While we all struggle with poor sleep from time to time, your sluggishness might run deeper than you think. Here are 5 common sleep mistakes that are costing you your good night’s sleep (and your sanity). 1. You don’t have a routine. It’s hard enough to get your kid to bed on time, now you have to get yourself to bed on time as well? It sounds extreme, but it’s essential to your health. If you’re always waking up feeling fatigued, odds are your body is confused. Your body comes to rely on your sleep schedule. If you’re going to bed at 9 pm on some nights and 2 am on other nights, it’s not sure when you want it to naturally fall asleep. Instead, stick to a routine. Be reasonable, and make sure this is something you can stick to. Of course, there will be nights when you’re up late with the baby or you’re finishing that last chore, but make a real effort to go to bed at the same time every day. Yes, that means weekends too. 2. Your bed is outdated. Are you sleeping on a mattress that’s almost as old as you are? A bad mattress leads to chronic pain and poor sleep quality. If you’re prone to waking up sore and tense, your mattress might be to blame. Luckily, it’s easier than ever to find a mattress that fits your body thanks to the internet. Consider a power bed that you can adjust to your unique needs. You work hard and deserve a great night’s sleep too. 3. You’re taking daily naps. It’s tempting to fall asleep as soon as your baby does, especially if they’re not sleeping through the night, but these naps might be ruining your sleep. When you take long naps throughout the day, your body has a harder time falling asleep when the sun goes down. If you’re struggling to stay awake throughout the day, look for healthy ways to keep yourself alert like tea and clean eating. An alternative to the long naps is the power nap. Though it takes some practice, a 20-minute nap can do wonders for your brain. Take one as soon as your baby goes down for his or her nap to wake up refreshed and ready for the rest of the day. 4. You eat sugar before bedtime. We all love a yummy late-night snack, but these cravings aren’t doing wonders for our sleep. Sugary snacks before bedtime actually mess with the chemicals in your body. That natural “sugar high” is what keeps you up into the late-night hours. Try not to give in to these cravings and save your sugary sweets for earlier in the day. If you must snack at night, choose something high in protein and low in sugar. 5. You worry about sleep. Finally, one of the problems that will keep you up time and time again is worry and anxiety. When you’re hyper-focused on getting the right amount of sleep so you can be the best mom, you actually cause the opposite to be true. There’s nothing worse than trying to fall asleep when you’re anxious and staring at the clock. Instead, create healthy sleep habits. Follow the natural flow of your body. Only go to bed when you feel tired. Let yourself naturally fall asleep. If you’re laying in bed for more than 20 minutes, leave the room and do light activity somewhere else in your home. Return to bed only when you feel yourself starting to drift off. This will teach your body that the bed is for sleeping, not for worrying. As a mom, you need all the sleep you can get. 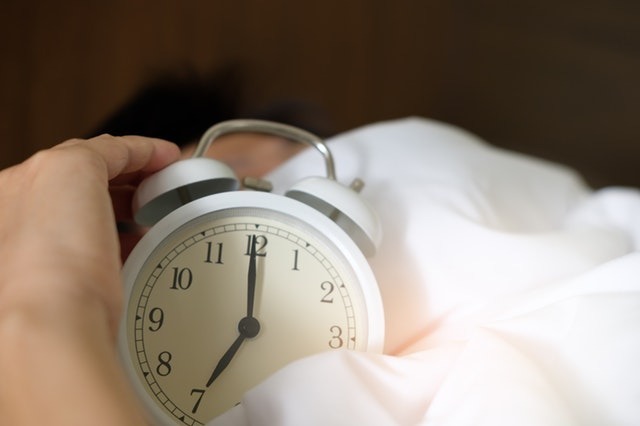 It’s easy to fall for any of these sleep mistakes above, but they don’t have to ruin your health. Start creating strong sleep habits today that prepare you to be the best parent every day.